Complexity in organizations is a hot topic right now. With technology advancements creating an interconnected world, companies have been struggling to adapt quickly. 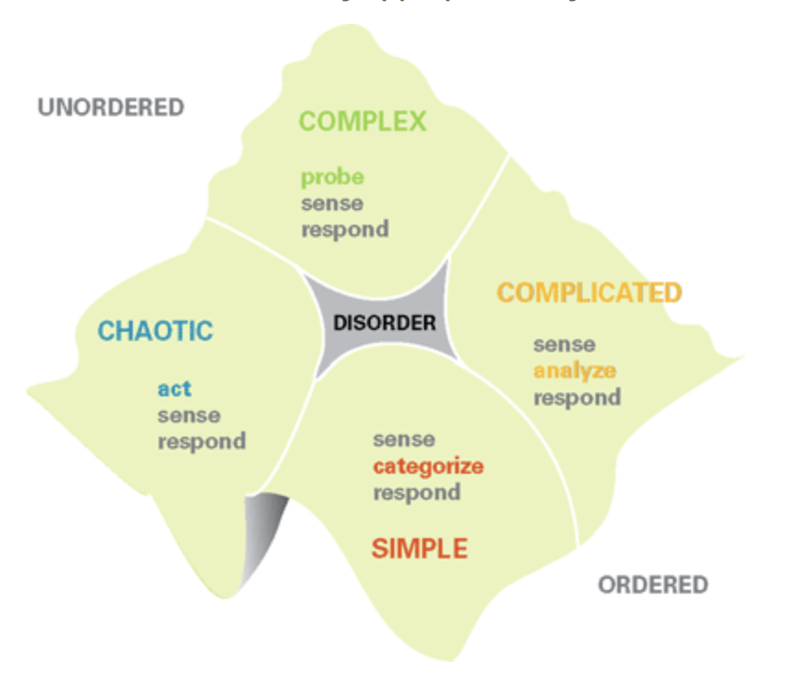 The Cynefin sense-making framework suggests that as we move from “complicated” to “complex”, our management approach should shift from analyzing to probing. What is the difference between “complex” and “complicated”? What does it mean to make the shift from analyzing to probing? Complicated: A complicated context is one where the cause-and-effect is knowable but not immediately apparent. You need an expert to figure out what to do. There is more than one solution to the problem. The action is determined by facts. Examples of complicated: Car repair, Software programming. When your car is acting up, you take it to the mechanic (expert). They tell you that you need to replace something but you could just put a band-aid on and see how that works. Complex: A complex context is one unpredictability. The cause-and-effect is impossible to determine in advance. There are “unknown unknowns”, in other words, we don’t even know what we don’t know. Information is emergent. The action is determined by following patterns. Examples of Complex: Weather, Traffic, Stock market. These examples might remind you of your local news update. The reason your local news gives traffic and weather every 10 minutes, is because they can’t predict it, all they can do is monitor (probe) and report on it (respond). You might be thinking “Meteorologists can predict the weather!” Stay tuned, we’ll get to that in a moment. Are you working in a Complicated or Complex context? Most organizations nowadays have moved into Complex, but are still using the management techniques of a Complicated environment. Here’s how the management differs. Complicated: Sense, Analyze, Respond. In a complicated context, we sense changes and then do some analysis before taking action. For example, I sense that my brakes feel different when I drive, so I take the car to the mechanic to analyze, then she gives me options to fix the brakes. Some complicated contexts require extensive analysis, such as debugging a software problem. Stuck In-between. It gets tricky as you move from Complicated to Complex because the analysis that used to work, stops working. Large Project Management is a great example of this. Project plans are made up mostly of estimates, tasks, risks and resource allocation. 4 factors that are analyzed by an expert (project manager + specialist who do the work) and the plan is put into action. However, projects regularly find that unknown unknowns sideswipe the predictability of their outcomes. The same effect is being noticed in predicting customer behavior. Gathering data and analyzing buying habits is no longer effective. Complex: Probe, Sense and Respond. In a Complex context, we don’t even sense that we need to take action until we probe. In the example of customer behavior, we’re not even sensing whether customers will buy our product, we’re probing for it. The shift here is that rather than gathering facts of past purchases and focus groups, we spend our time building probing systems. What does it mean to build a probing system? In the case of customer behavior, it means that we are looking at data on what the customer is buying right now, rather than what they bought or what the might buy. They respond to the actual buying, not a set of factors. The weather is a great example of probe, sense and respond. Historical weather does little to help with weather predictions, so meteorologists look at the storm systems that are happening right now. And as you know from large storms, they don’t really know the intensity of the storm until after the storm hits. Are you working in a Complex context? How are you managing? Let us know! Credit: Concepts in this article are based on the Cynefin framework.